Inspiration and advice for 2018! I’ll be the first to say 2017 was full of mistakes, successes, and lessons. In today’s solo episode, I share three reflections, four resolutions for 2018, and one revolution! I hand selected these topics for your benefit and to invite you to play a bigger game this year. I share stories about some of my limiting beliefs and how I was able to transform them, what I learned while I was sick in a cabin in Vermont, and what feeling sad taught me about my communication skills. I also go over four of my personal resolutions for this coming year and why I chose them, and invite you to one big revolution! If you’re excited about personal growth, challenging yourself more than ever, and showing up in a whole new way, you’re going to love today’s episode! Angela Lussier is the founder of the Speaker Sisterhood and also an award-winning speaker, four-time author, and two-time TEDx presenter. 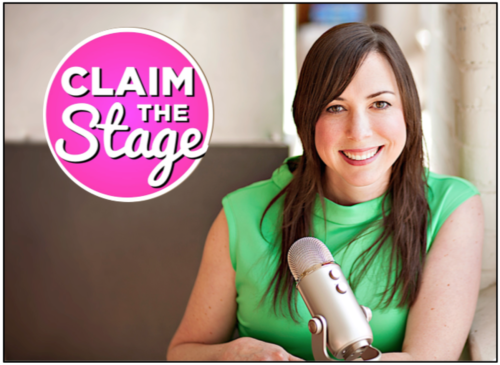 She is the host of Claim the Stage, a public speaking podcast for courageous women. Her motto: Stop waiting. Start creating.